This minimalist, modern Yellow Threaded Button Side Table has a colorful metal frame that bends into a handle for easy re-decorating. $198. Buy here. Five clips rest along the top of this hand-painted Clip Collage Photo Holder. Hang five of your favorite memories or notes upfront and center and maintain a sunny disposition all year. $39.95. Buy here. 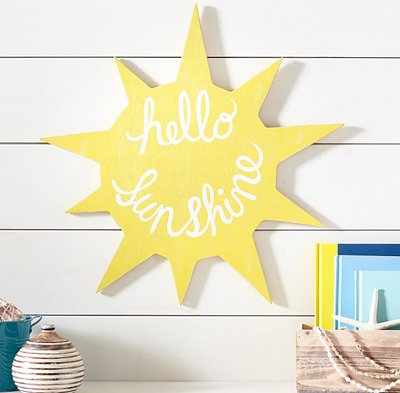 Bursting with bright inspiration, this shaped Sun Sentiment Art Plaque brings a ray of sunshine to any space. $49. Buy here. 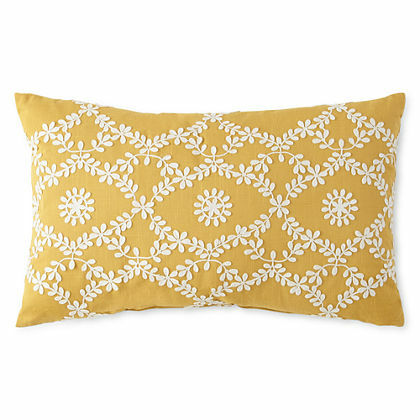 Traditionally inspired and elegant in design, this Abby Floral Oblong Decorative Pillow is an ideal complement to any classic room. $40 Sale $27.99. Buy here. 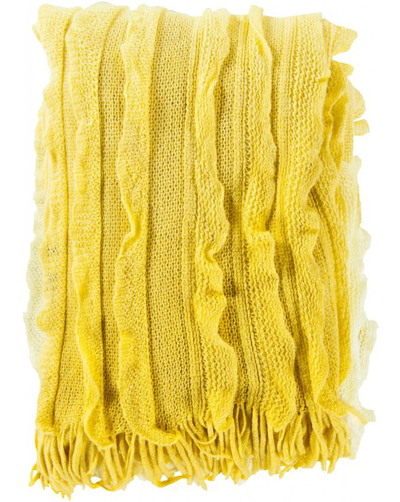 A sculptural ombre ripple weave helps to set this Lemon Penelope Throw apart. Fold it or drape it for the perfect pop of color. $50. Buy here. 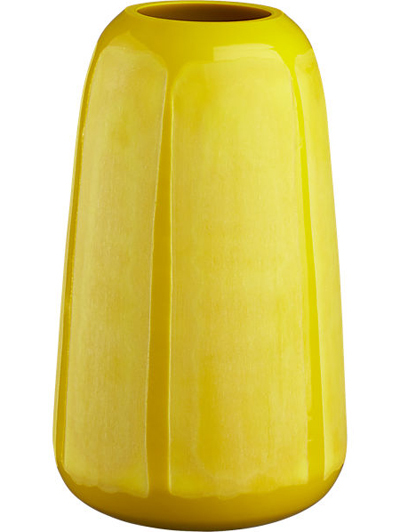 This handmade golden Butternut Glass Vase is a bold play on color and texture. Engraved by hand, broad, freeform strokes align matte bands from top to base around softly tapered form, alternating in modern contrast to glossy finish. $19.95. Buy here. 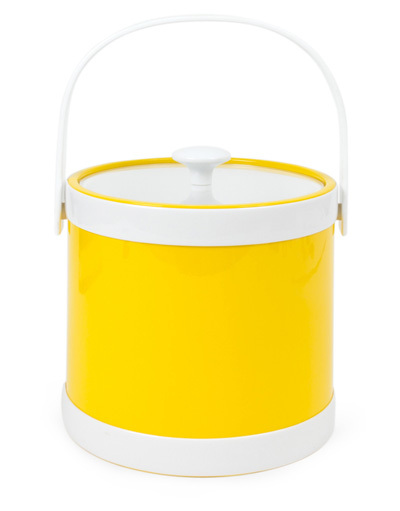 This 3-quart insulated, American-made Yellow Ice Bucket is more than just a great ice bucket. It’s perfect for cooling wine, champagne, soda, or even serving chips, candy, and pretzels. It can also work as a fashion coordinated centerpiece for plants or flowers. $32. Buy here. 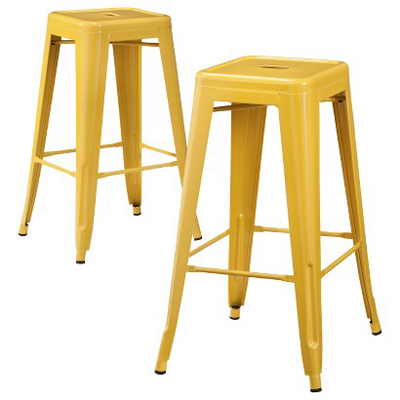 Add a pop of brightness and fun to your kitchen or dining area with a set of 2 Carlisle Yellow Metal Bar Stools. Tuck them under your breakfast counter, in the corner of a room as an accent piece or keep them handy for extra seating. 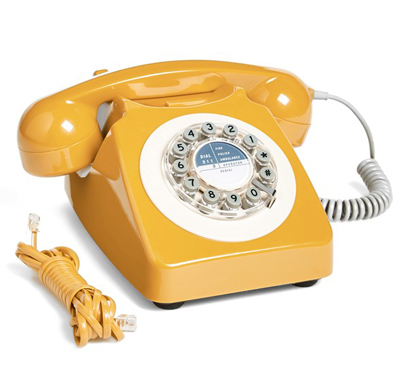 $99.99 Sale $84.99. Free shipping. Buy here. 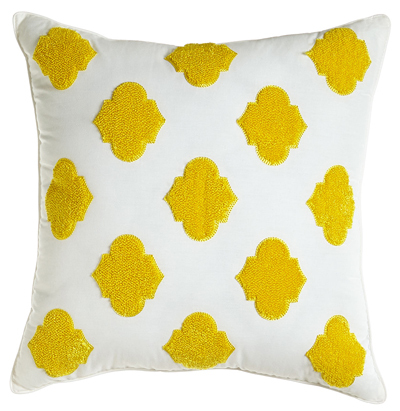 Wake up on the sunny side with this White Pillow with Yellow Chenille Design. Cotton pillow measures 16″ square. $55. Buy here. 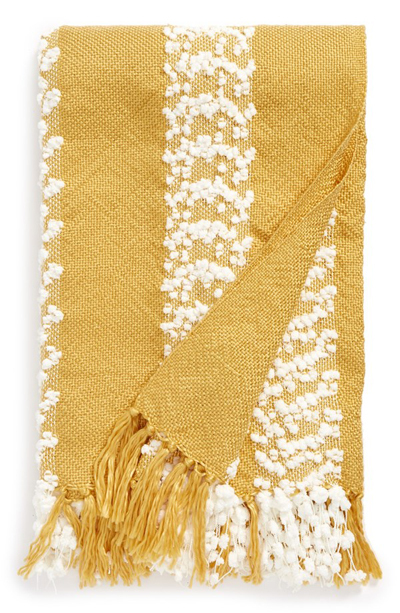 Plush pompoms stripe this cozy Yellow Pom Stripe Woven Throw edged in a soft fringe—perfect for snuggling in style when the nights grow chilly. $48. Free shipping. Buy here. 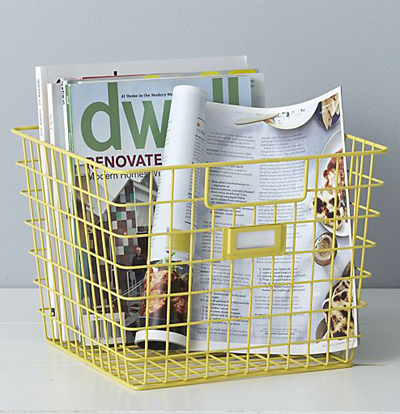 Crafted of sturdy steel wire with a durable yellow powdercoat finish, this tapered open Yellow Wire Bin holds and organizes household items with convenient carrying handles and ID label holder. $16.95. Buy here. 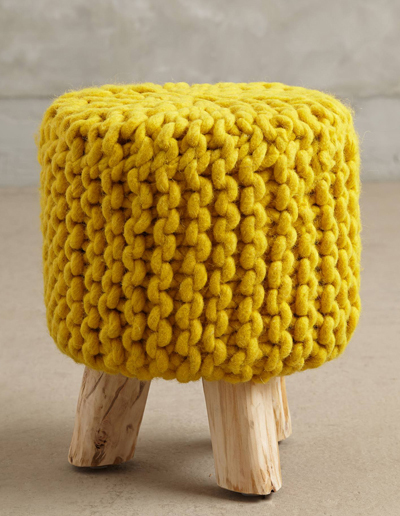 This Handknit Tuffet adds a fun pop of color to any room. Made of wool and eucalyptus wood. $98. Buy here. 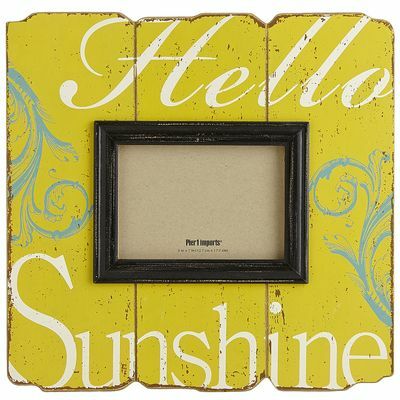 Brighten your day and your wall with this hand-painted Hello Sunshine Frame. The oversized frame has a horizontal opening for a 5×7 photo. $22.95. Buy here. 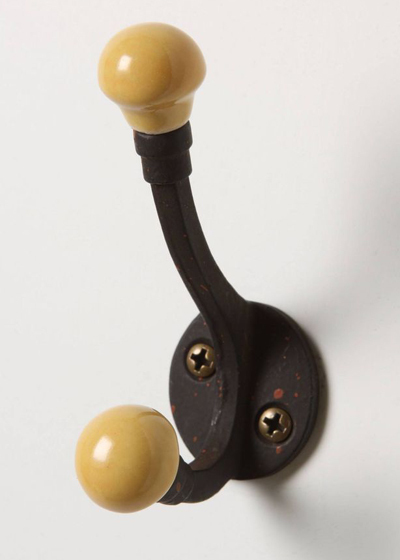 The pastel ceramic buds on this Yellow Trolley Stop Hook provide a pretty platform for favorite sweaters, purses, robes and more. $12. Buy here. 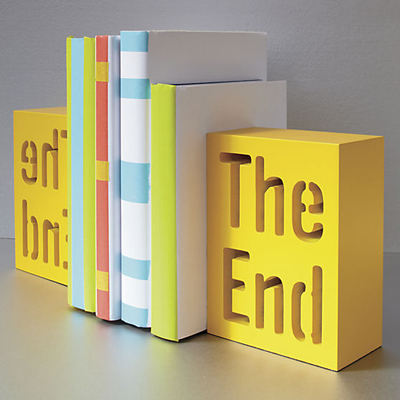 This fun yellow The End Bookend features stenciled typography lasercut in MDF. $14.95. Buy here. 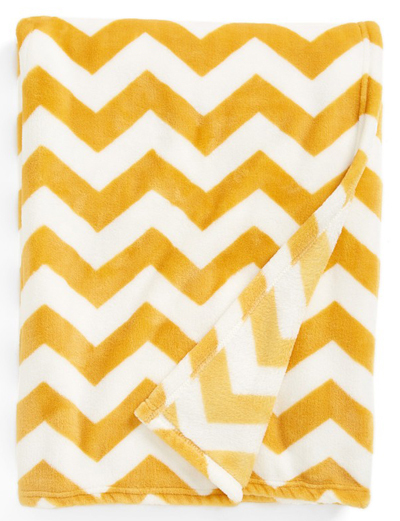 Ward off winter chills with this brightly striped Chevron Plush Throw made of plush microfiber that works as well in your living space as it does in the bedroom. $38. Free shipping. Buy here. 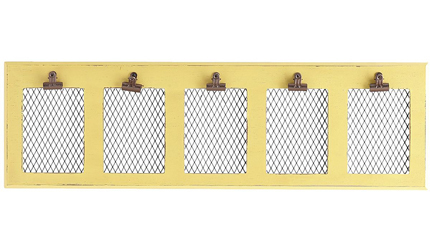 This vintage-looking pine Yellow Scalloped Window Clip Frame with handcrafted scalloped edges is actually a memento board. 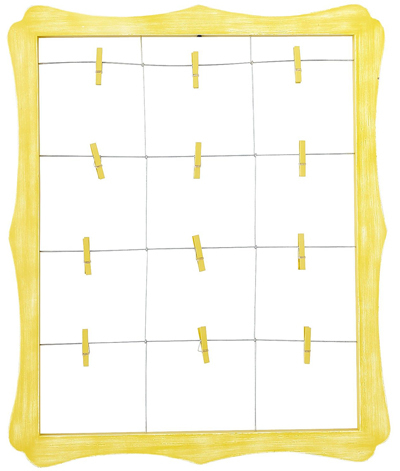 The wire grid with a dozen clips lets you personalize it with notes, photos, souvenirs, artwork or grocery lists. $39.95 Sale $31.98. Buy here. 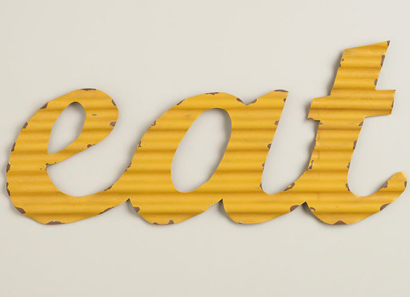 Add a vintage-inspired note to your kitchen decor with this Yellow “Eat” Metal Sign. Crafted of rippled metal, it’s artfully antiqued for a timeworn appeal. $9.99 Sale $7.99. Buy here. 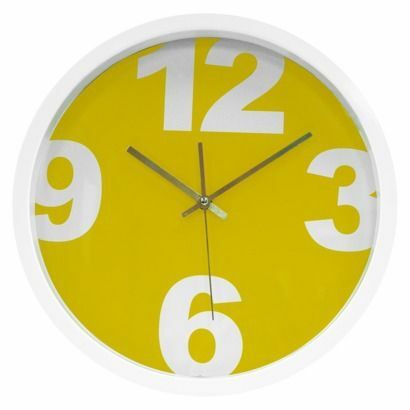 This fun Contemporary Yellow Clock adds a pop of color to any room. Measures 14″ x 14. $19.99. Buy here.